After Kuldiga, we drove to Talsi to spend the night. 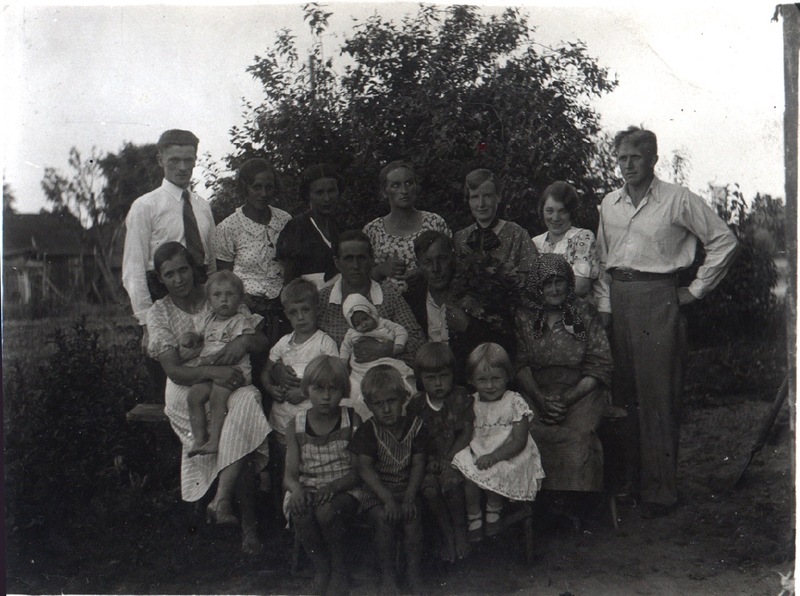 We found out that Ansis wanted us to visit Talsi because that is where our Uncle Arnolds lived after World War II. He was a soldier in the Latvian Army fighting for the German side when the Russians began to move in. Most of the German soldiers had evacuated, and he had orders to travel through Talsi with his five companions. The legend is that the night before he was to move out of Talsi, a little voice told him not to go, so he fled, found civilian clothes and met his new family. The five soldiers he was with were captured and shot the next day by the Russians. Grinbergs family in Germany sans Arnolds. Liesma is holding the dog. 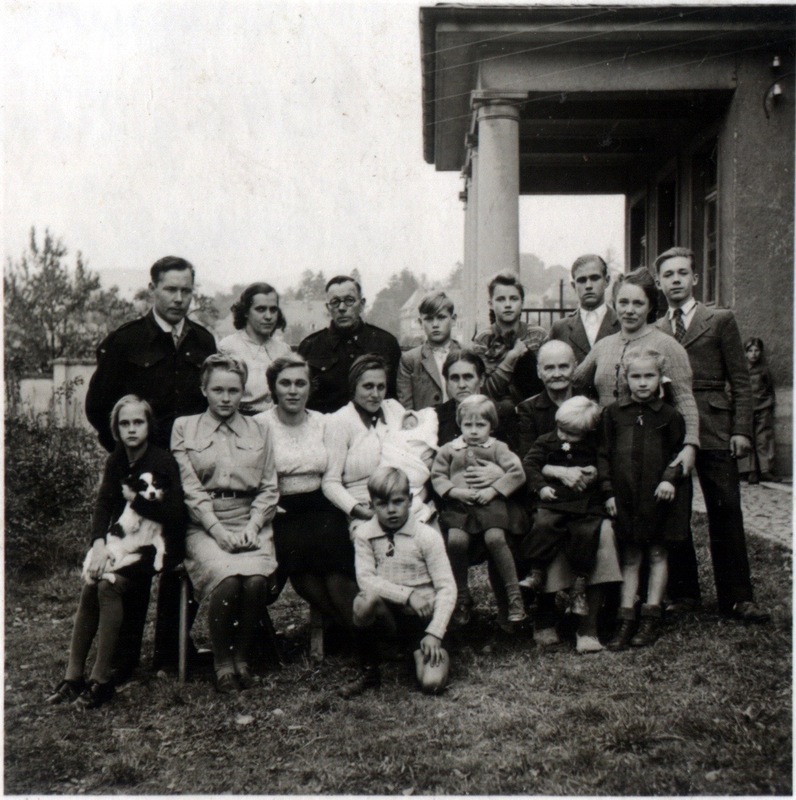 Arnolds was left behind in Latvia while the rest of the Grinbergs, including his wife, Alma and five young children, Aivars (deceased), Gunta, Vija, Mara (deceased) and John all fled to Germany. My mother (Arnolds’ youngest sister), Liesma was a part of this group. Arnolds had no contact with his family, and no one knew if he was alive or dead. He eventually remarried and raised Bruno Grasmanis as his own son. Bruno’s own father was sent to the Russian front and disappeared toward the end of the war. 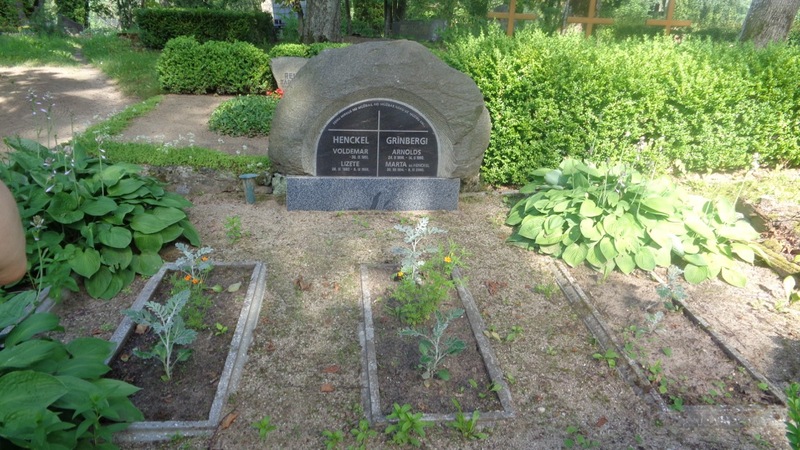 When we arrived in Talsi, we visited Arnolds’ grave. Ansis carefully cleaned the gravesite removing all the weeds and debris. 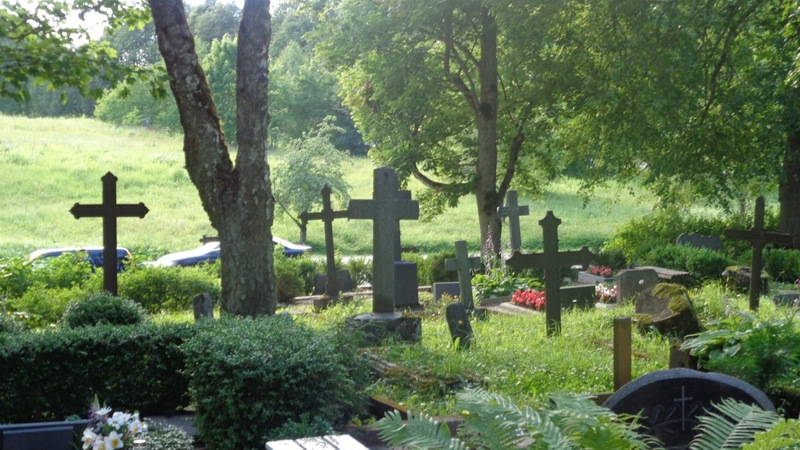 We marveled at how the Latvian cemetery looked and felt more like a beautiful garden than a burial ground. Instead of grass, each grave has a small space to plant flowers that bloom eternally. This seems like a much better system than ours. It was serene, peaceful and filled with beauty and life. After the cemetery, we continued to our small hotel near the lake in the center of this small town. Ansis pointed out that we would see the “postcard shot” as we headed around the bend, and sure enough, there was the historic village on the other side of this charming lake. Sue and I both got our cameras out. 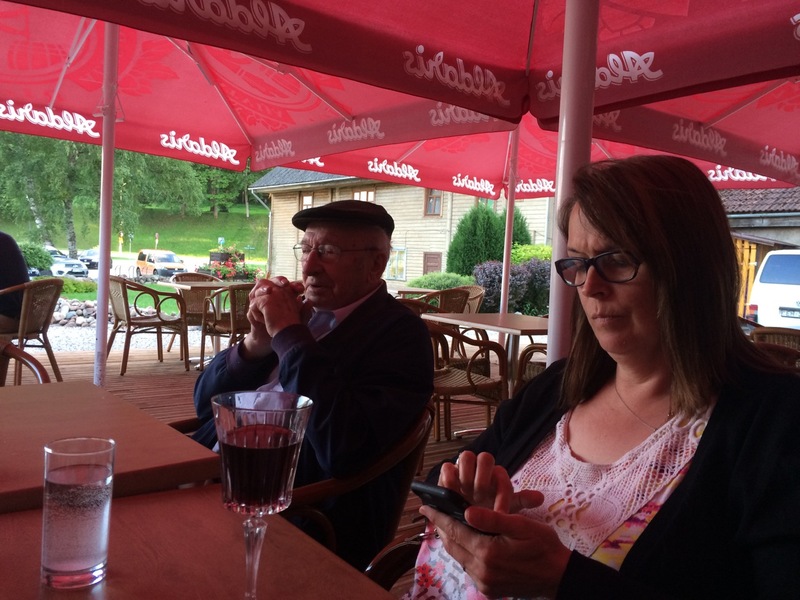 The hotel was small, and Vitauts’ television remote control didn’t work, so I learned the Latvian word for “It’s broken,” (tas nedarbojas) and told our hostess. She tried new batteries to no avail, but Ansis let us use his remote, and now dad had a t.v. to watch while we went to walk around the lake and explore the village. Bruno left us to go to stay with his wife Maruta in Apragciems while Ansis went to fill up his car with gas. So Susan, Glen and I ventured out on our own climbing up the first of Talsi’s nine hills (Ansis explained that later). I pointed out that Rome only has seven hills, so Talsi is superior to Rome! When we got to the other side of the lake, we found a place for supper and Ansis reserved us a table on the patio for 7:45 p.m. It was about 6:30, so we had time to walk around. I decided to rent a bike at the shop instead of walking just because. Actually, my left knee and hip have started to hurt all the time, so I thought the bike might be a better option. 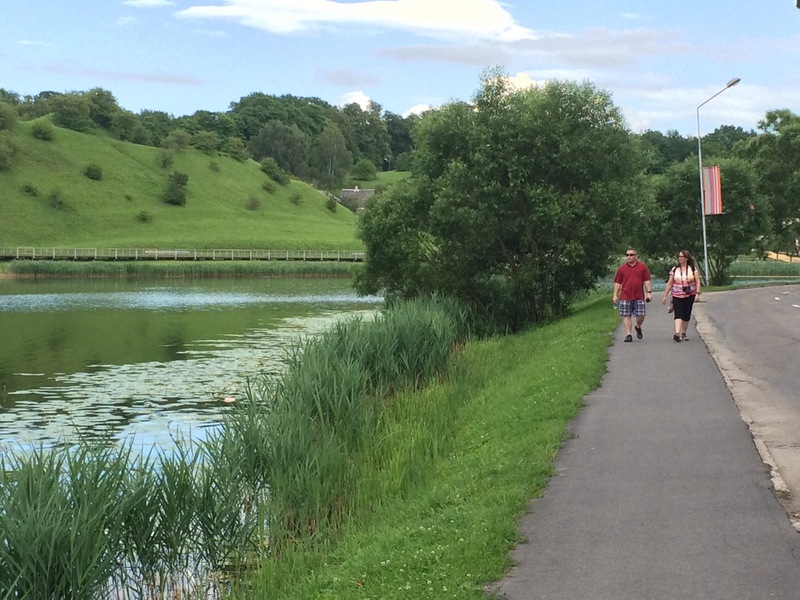 See the gallery below for the Latvian Lowrider experience! 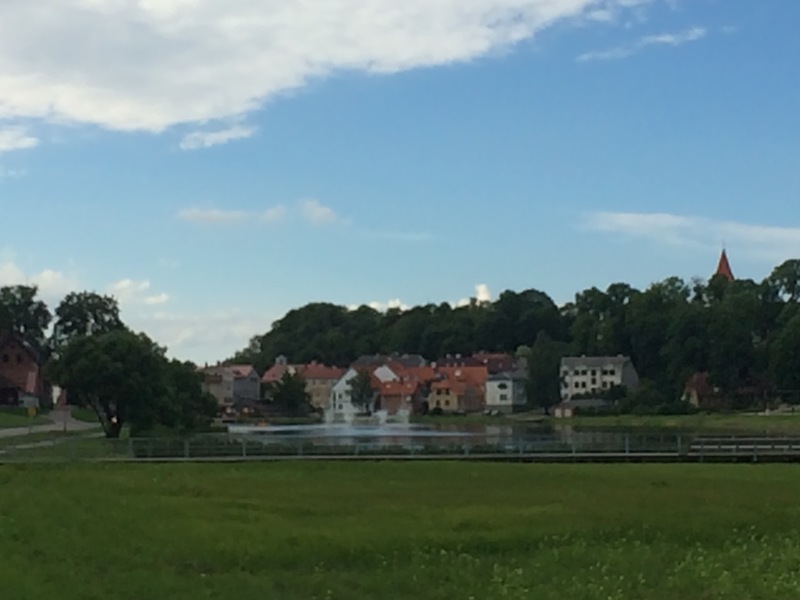 Talsi was not as pristine as Kuldiga, but it had it’s own Latvian Loveliness. 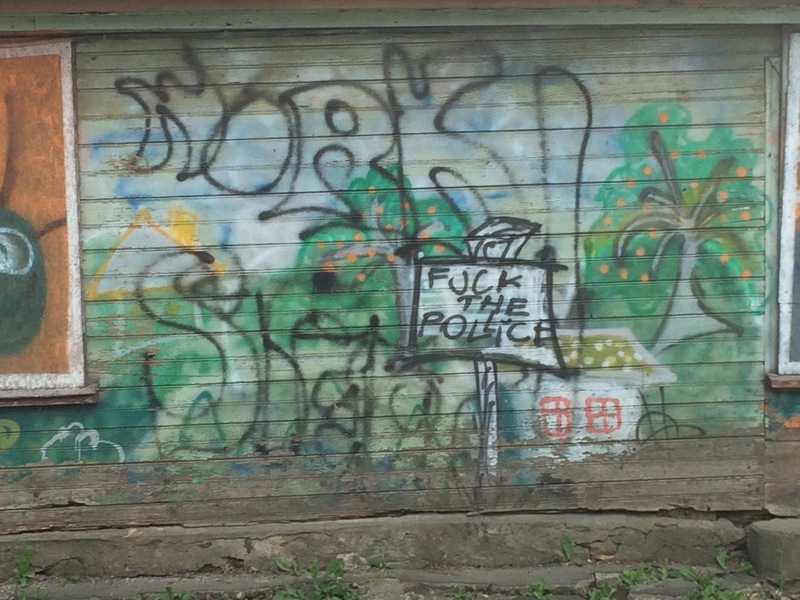 We saw some interesting graffiti as well as a church built in 1569 (which we would attend the next morning). I had some coffee and rode up and down three of the hills eventually meeting up with Ansis, Susan and Glen for supper. It felt wonderful to get lost on the bike and it only cost 1.5 Euro for two hours. 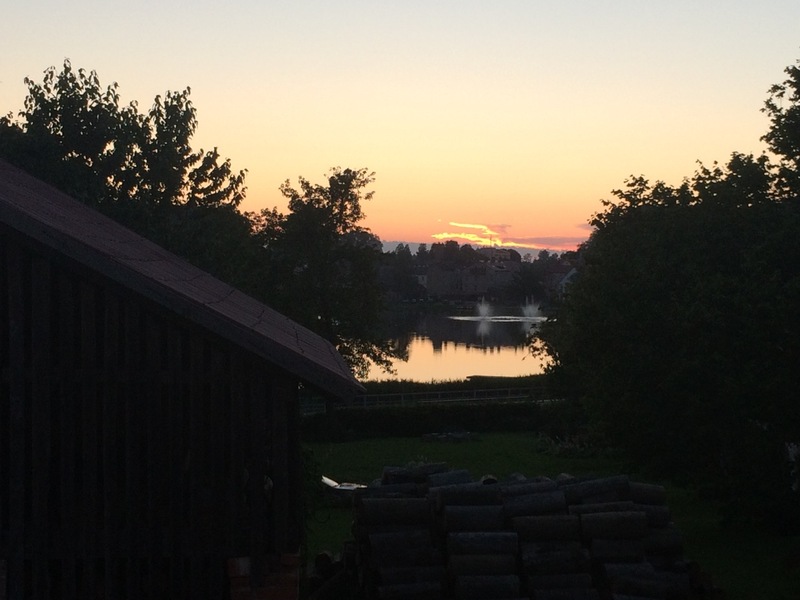 and laughing and having a jolly time on the patio as we watched the reflection of the sun on the lake. But by about 10 p.m., we were all tired and decided to call it an evening. After all, we were heading to church in the morning. The biggest disappointment was to find that there was no place in Talsi that was open for breakfast on Sunday. Perhaps this is the culinary opportunity that someone is waiting for! Clouds hover below as its rays pour down liquid light. I am in want of nothing. 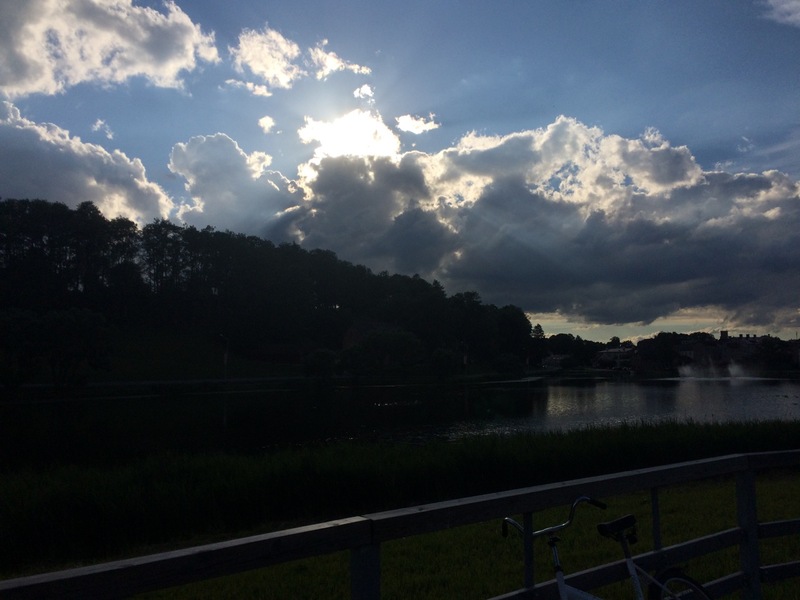 Sunset at Talsi, achieving clarity. It is what we lack which makes us what we are.